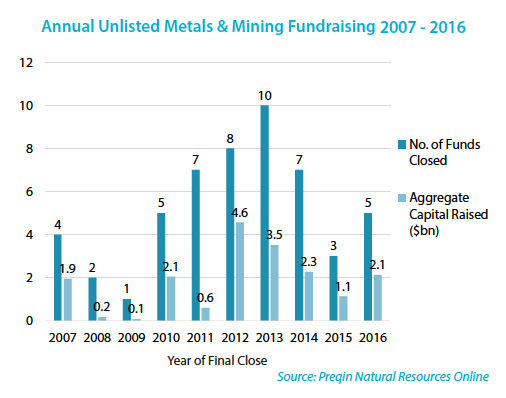 According to a new report by private capital tracker Preqin, overall fundraising for natural resources investment actually declined by a fifth in 2016 to the lowest since 2012. Coming off a record 2015, 74 funds raised a total of $60bn in 2016 for investment in natural resources, which includes metals and mining, water, timberland and energy. Private providers of capital include pension funds, sovereign wealth funds, endowments, family offices and others. In 2015 mining and metals made up a paltry portion of funds raised with three funds closing on $1.1 billion in 2015. Last year five funds managed to raise $2.1 billion. 2012 was the peak year for mining fundraising with $4.6 billion of capital commitments from investors. That's still small beer compared to the money going into oil and gas however. The top 10 largest natural resources funds that reached a final close in 2016 raised $38 billion. All 10 are focused on energy-related assets, and all but one focus on projects in the US. So called dry powder – money ready to be invested – for natural resources now total $187 billion. That's double the tally at the end of 2011 mostly on the back of a sharp rise in energy-focused funds targeting North America with uncalled capital commitments. Preqin says that "may be an indication that although fund managers are securing new capital commitments, they are finding it more difficult to put this capital to work in the current environment." Dry powder destined for mining totals around $5.5 billion while funds still have to exit $10.7 billion worth investments. Some money will also flow into mining from diversified funds which have $12.3 billion ready to be injected into natural resources, but according to a recent Preqin survey none of the energy-focused funds which have $206 billion on call are looking to invest in coal assets. Importantly for the continued growth of the asset class, investors are willing to back their positive sentiment towards natural resources with fresh capital commitments: 26% expect to allocate more capital to the asset class in the coming year, compared to 22% that will be allocating less. This is a dramatic improvement from the end of 2015 when 41% were looking to allocate less capital in the coming year. In 2017, across natural resources 252 funds are look to raise just around $105 billion. Of those only 13 are primarily focused on metals and mining and are hoping to raise $5.9bn. The biggest mining-focused fund is China's Power Capital which is seeking $3bn to invest in Asia. Diversified US-based Energy and Minerals Group is looking for $4 billion. Preqin spotlights the Electrum Strategic Opportunities Fund with a target of raising around $250 million as one of the funds to watch this year thanks to its eye-watering net investment multiple of 2.05. 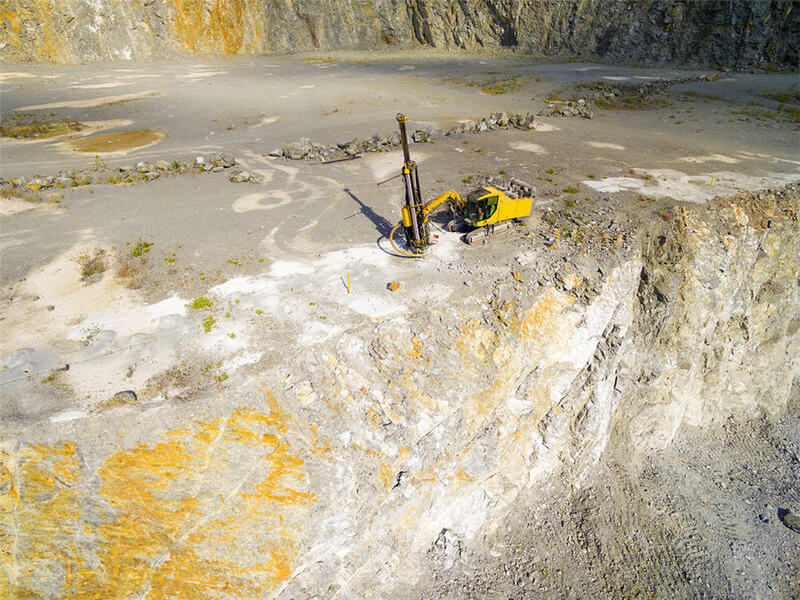 Electrum, launched in 2015 by prominent metals investor Thomas Kaplan invested in two junior mining companies based in the Yukon, Wellgreen Platinum and Victoria Gold, last year. Electrum also acquired a stake in Kaminak Gold, another Yukon explorer, prior to its sale to Goldcorp for C$520 million. Resources-focused funds now have a record $455 billion of assets under management. Mining and metals only makes up 4% or $16 billion of the total whereas energy represent nearly 80%. 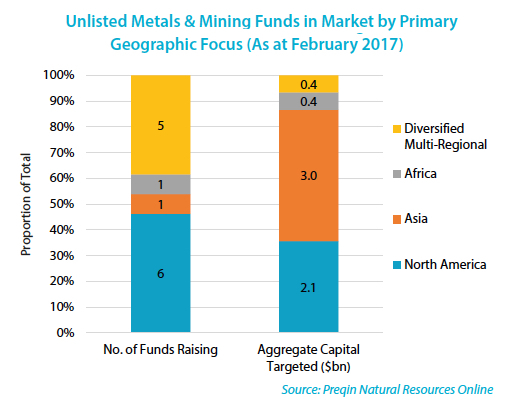 Tom Carr, Preqin's head of real assets products, says there is more diversity present among those funds that are currently in market: "In particular, large vehicles focused on mining and agriculture may see these sectors account for a greater proportion of activity than in 2016." Private capital encompasses a range of investment vehicles and strategies including traditional private equity such as buyout, venture capital and turnaround funds, private debt including distressed debt and direct lending, and private real estate, infrastructure and natural resources funds. A total of $602bn were raised by 1,228 funds across all strategies and sectors in 2016 according to Preqin data. Total assets under management by private capital has reached a record of nearly $4.5 trillion.